The strange cat appeared once again! She was blocking my way as I tried to jump up onto my mistress’s lap. The newcomer was black with eyes the color of my pet frog, Slimey. Slimey and I had been friends for, well, like forever, and he really was a very pretty color. My birth mother had taught me to look for the good in others—Slimey smelled bad, his eyes were yellow and black like the nasty bumblebee that had recently stung me, and his plop-hopping wasn’t at all graceful like my movements were. But he was a lovely shade of green. Just like the intense eyes that stared at me now. “Who are you and why won’t you leave me alone?” I asked the black cat. “This is my territory.” I managed to climb onto my person’s lap and then passionately knead it for emphasis. My mistress sighed with contentment. At least I thought it was contentment, until a single tear ran down her cheek and dropped on my nose. My long tongue reached out and flicked away the salty water. “Now look what you’ve done!” I shrieked at the interloper. I patted my person’s wrinkled hand and purred to offer comfort. “It’s time to leave now,” Green Eyes said. “Remember the bumblebee?” Green Eyes asked. I groaned as memories flooded. Writhing in the tall grass, my throat closing, unable to breathe, moaning and struggling—but I got through it okay. I forced myself, because I had made a promise I wouldn’t break. I am a cat of my word. Just then, I heard a thump on the back patio door and looked over to see Slimey. In his pitifully spastic way, he was jumping around and knocking against the door. The noise caught my mistress’s attention, so she stood and went to investigate. Unceremoniously, I slid off her lap, onto the floor, and landed in an undignified heap. The glass door slid open, Slimey leapt inside, my mistress emitted a startled yelp, and then hobbled around in search of the intruder. When her back was turned, I noticed that a small kitten appeared and stood forlornly in the doorway. The kitten looked at me, blinked, and uttered a hesitant little mew. “Go away!” I hissed. Why was everyone suddenly intruding on my territory?! A lion’s roar escaped the kitten—although in reality it was just a super loud purr. I admit that in my current irritable state of mind all my senses seemed heightened. Slimey hopped-plopped back outside, and I heard a splash as he dived into the koi pond. My mistress sat back down in her favorite chair and placed the kitten in her lap. I was about to jump up there too when Green Eyes intercepted me. Shock flooded me. I grew dizzy. My mind rebelled, but my heart told me it was true. “I’m dead? But what about my promise? I’m a cat of my word….” My thoughts trailed off dismally. I had failed to perform my mission. The photo used in this post is a kitten named Celeste awaiting adoption at Best Friends Animal Society––the nation’s largest no-kill animal sanctuary. 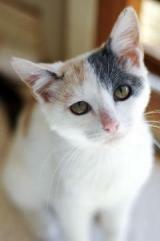 Please visit BestFriends.org to learn more about her and other animals who need forever homes.